An Indian wedding is a combination of rituals, ceremonies and celebrations. It is, thus, a blend of beautiful colors and ethereal decorations. Decorations, in fact, give a life to an Indian wedding. They play a major role in creating and enriching the ambience and could completely mesmerize the couple and guests. However, it is important that one follows the latest trends and incorporate hottest décor ideas in her wedding. Lights can significantly impact the ambience and the wedding. While big and extravagant chandeliers were a big hit last year, traditional diyas and Christmas lights are making waves this year. Also called fairy lights, Christmas lights add a warm and romantic glow in every setting. They can be utilized both indoors and outdoors. 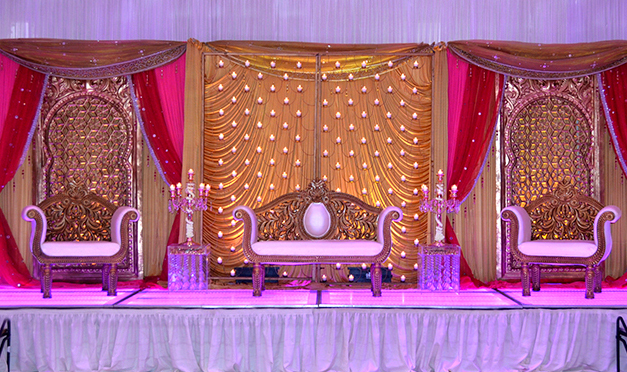 Your path form aisle to mandap will look stunning with a number of strings of colorful fairy lights. Wrap these strings around the trees or pillars to make the venue look more than beautiful. The fairy lights are versatile and could be used in various ways. In fact, you can use the strings as backdrops too. For special charisma, light up the venue with beautiful metal lanterns or paper lanterns. While fairy lights and lanterns provide a dreamy ambience, diyas are never too old for a wedding. In fact, they along with marigold garlands can make a stunning entrance. Delicate and ethereal things are awe-inspiring, isn’t it? Delicacy has its own grace and it seems royal, and royal themes are in these days. There is so much emphasis on lace and it isn’t with the lehngas (bridal dress) only, but the décor too. The lacey table covers along with gold-plated crockery, vintage-looking flowers, and simple diamond embellishments are one of the popular Indian wedding décor ideas for 2015. This décor is, particularly, ideal for those who have always dreamed of a royal wedding. Flowers are a nature’s gift and are an essential part of Indian wedding décor. In fact, floral décor is enough to enhance the ambience and appearance of the venue. Thus, incorporate the flowers into every aspect of the décor. Imagine the walls covered with flowers, floral chandelier, floral carpet and curtains. Doesn’t this sound so pretty? Moreover, the floral décor would add brightness, softness, fragrance and beauty to the wedding event. Remember, floral décor is in vogue these days. The antique chairs decorated with ethnic drapes and cushions and a swing (jhoola) would show your traditional inspiration behind the décor. Both swings and antique chairs for the bride and groom make for great wedding décor. Indian weddings are a blend of elegance and tradition and these regal and floral themes, fairy lights and diyas serve both purposes. Glamorous Even Planners takes complete responsibility of your Indian wedding’s in NY. If you find these themes inspiring and fascinating, contact us.